Hydraulic fracturing has proven to be a useful, albeit controversial process for the extraction of oil and gas from shale rock formations. Prudent to the development and long-term undertaking of a fracking operation is to take the appropriate steps for preliminary assessment as well as ongoing monitoring of the area. And YSI’s environmental monitoring instrumentation solutions can provide spot sample or continuous 24/7 capabilities to deliver critical, real-time data on the conditions at or near hydraulic fracturing sites. The systems can provide early warning for the accidental release of pollutants – or reassurance that water quality has not been affected – which is critical to minimizing the environmental impact to area communities. There is a tremendous amount of water needed to sustain the hydraulic fracturing process – as much as 5 million gallons per horizontal deep shale well. To assess and address some of the issues related to water use, there are studies that gas companies and communities can undertake at the outset – before the establishment of a well should even be considered. Water availability studies can be commissioned to obtain required permits and to better understand the impact that extensive water use may have on watersheds, aquifers and sensitive aquatic habitats. The YSI Level Scout, a pressure transducer, can be used to conduct pump tests on the source aquifer. The data collected can help to assess hydraulic characteristics of the aquifer and determine whether or not removing large amounts of water for fracking will negatively impact residential or municipal wells and local area stream flow. Additional instrumentation from SonTek can also be used to conduct water velocity, flow and/or total discharge measurements in surface water systems. The data collected from these field instruments can help to better understand if the water used for the fracking well will negatively impact water systems downstream. And depending on the results can ultimately help to secure – or challenge – water use permits. For gas companies, drill operators, monitoring agencies, environmental consultants, or private citizens, it is critical to obtain high-resolution water quality data at the outset. And it has become best practices to determine baseline water quality in nearby wells and surface water bodies before any well activity has begun. The increased erosion from moving heavy equipment into rural areas to establish a well can potentially impact small watersheds. As the well is established and operating long term, there is also a risk of spillage of flow back water during treatment and/or transport. 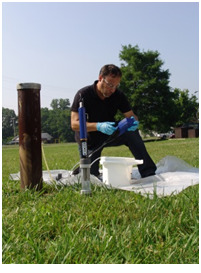 Ongoing data collection via spot samples or continuous monitoring of nearby groundwater and surface water systems can be compared to the original baseline data, to ensure that environmental impact is minimized due to drilling activities. Once the data has been collected and a baseline of water quality information has been established, the continuous monitoring of the area around the fracking site is necessary to assess and address ongoing environmental impact. YSI ground water monitoring instruments, such as the EXO multiparameter water quality sonde, can be deployed to easily and efficiently collect data on any number of parameters, either down-well or in a flow cell. Down-well sensors can be installed to take spot measurements or used continuously for long-term unattended monitoring. Flow cells are offered in various sizes, including low volume for low-flow purge studies, and can enable samples to be collected and sent to a lab for further analysis. In addition to enabling data collection and monitoring of ground water, YSI field instruments –proven to withstand the harshest field conditions – can be used for surface water assessment. Both spot sampling and real-time monitoring systems can be used to collect water quality data in nearby streams, rivers and lakes. To obtain spot samples for surface water data, a handheld field instrument dips the sensors in the water and records the measurements. For long-term monitoring studies, a user can easily program a logging instrument to autonomously record data at predefined intervals prior to deployment. One of the primary aspects of monitoring the hydraulic fracturing process over the life of the well is to assess the “produced” water. 10 to 50% of the injected water is recovered from the well, which comes back as brine due to the geology of the fracked well and the chemicals used to develop the well. As a result the produced water needs to be treated before it is recycled. Much of the water coming out of the well is typically treated on-site, so it can be recycled for reuse in the hydraulic fracturing process or transferred to a treatment facility. The briny composition of the flow back water requires it to be sampled and/or monitored to determine if it is ready for reuse or transport. YSI’s process instrumentation solutions, such as a conductivity sensor/controller combo, can be used to automate the process if necessary. Alternatively, if ozone is used for treatment, a YSI ORP process monitor can also be used to monitor the effectiveness of the treatment. To monitor and assess ground, surface or flow back water during the hydraulic fracturing process, common parameters that can be addressed with YSI instrumentation includes: Dissolved Oxygen, Conductivity, Temperature, Salinity, TDS, pH, ORP, Nitrate, Chloride and/or Turbidity. YSI photometers can also provide quick analysis of field or lab samples for various analytes including: Alkalinity, Calcium or Total Hardness, Chlorides, Manganese, Iron, pH and Sulfate. For continuous monitoring applications, data can be stored in the sensor/system for periodic download or transmitted real-time via WaterLog telemetry-enabled products. To provide automated data delivery, a real-time data acquisition system can also be deployed. Unfortunately there is no silver bullet to address all of the challenges associated with hydraulic fracturing. However, there are responsible steps to be taken with current real-time field measurement and monitoring technology that can safely and effectively monitor hydrofracking’s use of water and monitor surrounding natural resources. Kevin Simpson, Senior Project Manager for YSI Integrated Systems & Services, contributed to this article.